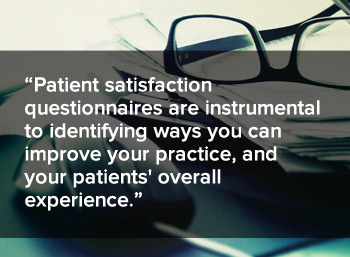 Patient satisfaction questionnaires are instrumental to identifying ways you can improve your practice, and your patients' overall experience. Happy, satisfied patients = repeat visitors (who are also likely to refer others to your practice). Your competition is fierce. No matter what kind of practice you have, there are competitors out there who want your current patients. Ensuring complete satisfaction for your patients should be a top priority. Administering a patient satisfaction questionnaire is another way to show your patients that you care about their feelings regarding the care you're providing, and to show that they have a voice in the type and level of care they receive. Don't delay in getting the survey into patient’s hands. While mailed surveys are common, it may be received too long after the appointment for the patient to recall the details of their entire visit. Consider delivering the questionnaire upon checkout in the clinic, or electronically, the same day. Patient satisfaction questionnaires can be administered in a variety of ways. Practices can make phone calls, distribute written surveys, or provide a link to an online survey. For more in-depth feedback, conduct focus groups or one-on-one interviews. Most practices use written surveys, which have proven to be the most cost-effective and easy to administer. There are a variety of options for surveys available. You can create your own, find a number of downloadable surveys online or contact an outside agency that specializes in customer satisfaction. This is your opportunity to collect perception based responses from your patients. Put "clinical results" questions aside and hone in on satisfaction based responses - how satisfied were they with how the level of service, education and options they received. Keep it to 1 page, but also leave the opportunity for general comments/feedback. Get a statistically significant number of responses. You’re going to get a mix of responses – a blend of compliments and opportunities for improvement. Hold on to them until you have a large enough number of results so you can adequately prioritize any changes. Make it a priority within your practice. If you’re going to offer a survey with the goal of improving patient satisfaction, then everyone in you practice must be aligned. To help cultivate this focus, include your staff in the development of the questionnaire and set time to review the results as a group. Discuss opportunities or ways to promote the survey through your website, in the clinic, or in a follow up phone call. By having, and embracing, a satisfaction focused environment you will be in a better position to act on the feedback. Put the information you've collected to good use. Administering your survey is just the beginning. Your action against the feedback is the true measure of its success. Constructive criticism about your practice can be hard to hear, but it also provides opportunity to meet (and exceed) patient expectations. Patient satisfaction questionnaires also generate a great deal of positive responses, which can be enlightening and motivating for everyone within your clinic. Celebrate the successes, and take time to develop the right solutions to any areas of improvement. Once a patient satisfaction questionnaire has become an integral part of your practice, continue to evaluate and adjust your survey as needed.